Does anyone know what size nozzle is recommended for applying Sig Supercoat? I’m about to invest in a set of spray guns and want to make sure I purchase the correct size. I’ve already reached out to SIG but have not heard back yet. Thanks! Check out Harbor Freight for a "touch up gun", something that will produce approximately a 5" fan of spray. I have a DeVilbis 503 gun that my dad bought almost 70 years ago for $17.50. The last time I checked it's was around $160.00 or so. It may have been discontinued? The older style guns were "suction cup guns". Today the "siphon type gun" with the paint reservoir on top are popular. Do as much research as you can, because there are many choices, and you will here many different suggestions. Thanks, Greg. I just learned while browsing Harbor Freight that my compressor is too small for any type of sprayer. Mine is rated at 2.6 CFM. The minimum requirement I see so far is around 5 CFM. oooh boyyy.... I had no plans on buying a new compressor. Look for a used compressor on sights like govdeals.com Also don't be shy. It's possible that you know someone who would let you use their compressor.? Good luck. I've sprayed gallons of lacquer finishing woodwork with the cheap (10 bucks on sale) Harbor Freight purple handled "touch up" sprayer and their small upright tank compressor rated at 2.6 CFM,.....it works fine..... just play with the thinning until it sprays decently. most brush grade lacquers cut about 1/3 sprayed just great. glass smooth finishes on raw wood with only two coats. Framed plane ready for two coats of Clear Dope. Wings doped and red trim applied. Sig Tennessee Red Dope. 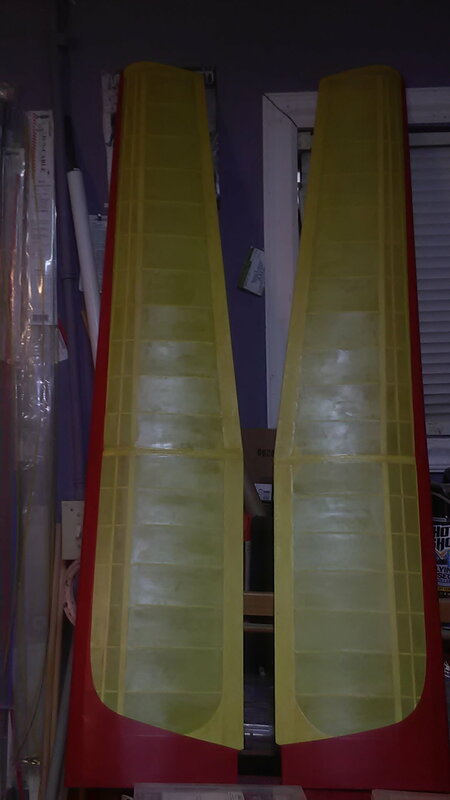 Wings ready for 2 coats of clear dope. 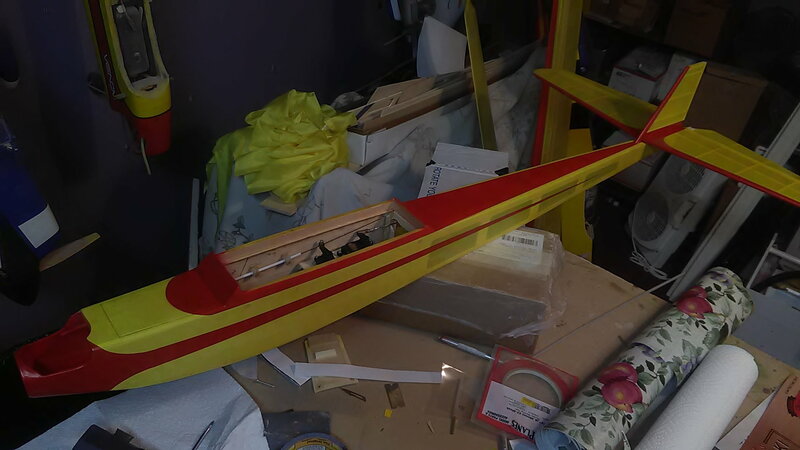 Fuselage painted with Sig Tennessee Red dope, and ready for two coats of clear which will be sprayed. The silk is a Dharma Trading dye yellow silk. You need a 1.0 nozzle that you get with the Harbour Freight purple touch up gun. I have two of these guns, one for clear and one for colors. Thin the Sig Super Coat 1:1 and you will have the right mixture for spraying. These little guns known as HVLP (High Volume Low Pressure) guns don't take much air. Your maximum air pressure should be no more than 30 psi. If you can't get a good spray pattern with that, you need to thin your paint more. These are not called siphon guns. Go to your local Automotive Paint store and get a gallon of Medium speed Reducer. It is the same stuff as Dope Thinner. Clean your gun with lacquer thinner. Here is a picture of a Butter Fly that I am just finishing using Sig Dope and Dharma Silk. I just sprayed the two coats of clear dope on this evening and haven't taken any pictures yet. The red trim was sprayed with an Air Brush. countilaw, your spraying advice above, is right on the money....... and exactly what I found works best for the lacquer I sprayed with that gun. finishing furniture I wanted a decent build on the finish so I sprayed just a little heavier and thinned somewhwere a little less than 1:1 not being concerened about weight one bit. the gun still sprayed real nice. 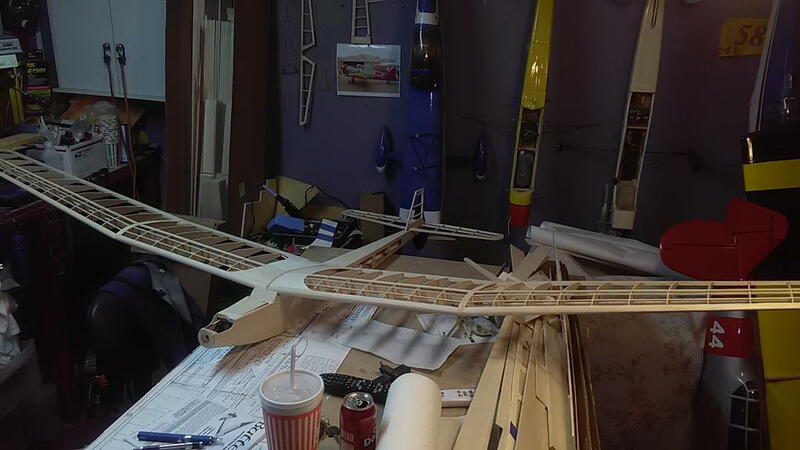 On a small thing like a model plane the panels are relatively small. Spray one panel/surface at a time. Keep an eye on the pressure in the compressor. When the tank pressure reaches the regulator pressure stop spraying and let the compressor catch up. You can practice this with an empty gum and pretend you are painting. You'll be surprised how much you can do with these smaller guns. Years ago, I painted a '46 Chevy pickup using this same method. It took some time, but the truck looked good. the ideal set up is to use an external regulator. attach it in line with your gun at the compressor and set it to the pressure you want to spray with. then you compressor can run independently of the air pressure you want and will never fluxuate your spraying pressure. I have a moisture separator and air pressure regulator that I got from Harbor Freight that plugs right into my compressor's output connection, then the airline plugs into that. I set that at 30 PSI. and it keeps that pressure constant, no mater what the compressor is doing, because 30PSI is only about half of the compressor's low cut-in pressure.